The RIM-162 ESSM (Evolved Sea Sparrow Missile) is the successor of the RIM-7 Sea Sparrow ship-borne short-range air-defense missile. The concept phase was begun in 1988 by Hughes and Raytheon, and called for a new missile compatible with Sea Sparrow launchers. In 1995, Hughes was announced as winner of the ESSM competition, and subsequently teamed with Raytheon for further development. Following the acquisition of the Hughes missile division by Raytheon, the latter is now the sole prime contractor for ESSM. 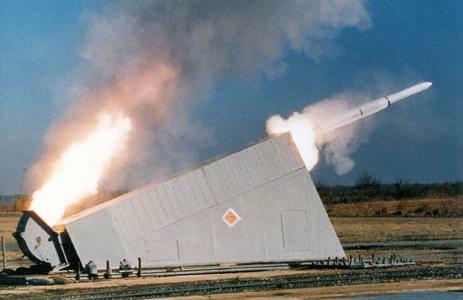 The RIM-162 is based on the RIM-7P, but is a new missile in almost all respects. It is a tail-controlled missile with strakes instead of wings and fins, using thrust vectoring to achieve a 50G manoeuvering capability. ESSM also features a completely new (boost-only) solid rocket motor of larger (25.4 cm, 10 in) diameter, a new autopilot, and a new insensitive-munition blast-fragmentation warhead. Effective range is significantly bigger than that of the RIM-7P, making ESSM a short/medium-range surface-to-air missile. 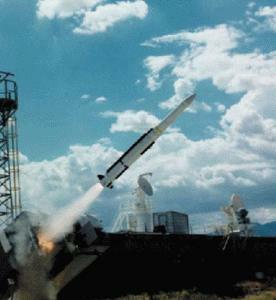 Tests of various ESSM flight test vehicles started in September 1998, and these tests included interceptions of target drones and simulated missile threats. The OpEval (Operation Evaluation) of the ESSM system was successfully completed in September 2003. Go-ahead for full-scale production was given in January 2004, and in February that year the U.S. Navy began to equip the first ships with tactical ESSM rounds. It is currently planned to produce four versions of the ESSM. The RIM-162A is designed for launch in the MK 41 VLS (Vertical Launch System) of AEGIS ships, with four RIM-162A missiles per MK 41 launch cell. The RIM-162B is a version for use with the MK 41 VLS on non-AEGIS ships, and therefore lacks the AEGIS S-band uplink. The RIM-162C and RIM-162D are derivatives of the RIM-162B, for use with the MK 48 VLS and MK 29 box-launcher, respectively.